The volunteer militias formed to fight the Islamic State group are now policing Baghdad’s neighbourhoods. But as they do, they compete with the real police, ignore the real laws and often act more like a mafia. Recently Baghdad local Jafar al-Aboudi’s son got into a fight with his neighbour at a local café. Al-Aboudi’s son ended up breaking the arm of the boy next door. After the incident the injured boy’s father appeared to be on the brink of going to settle the matter using tribal law. This would have meant that tribal elders in the area were approached and they would decide how much reparation – known as diyeh, in Arabic – was needed to see justice done. Often this involves the perpetrator of the crime paying money to the victim. 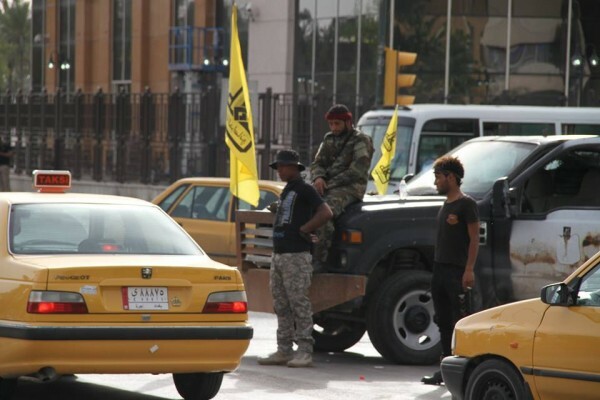 Members of the Saraya al-Khorasani militia on Baghdad streets. To avoid this al-Aboudi decided to go instead to one of the militias that controlled their neighbourhood. The individual who manages the offices of the Shiite Muslim militia in their area managed to solve the problem. The two young men were brought together to shake hands and hug. The offender apologized and his father promised to pay for the victim’s medical expenses. In the end though, the victim and his father refused any money out of respect for the offices of the militia, who have played a crucial but sometimes controversial role in the fight against the extremist group known as the Islamic State. There was no thought of going to the local police. A few days ago, his office was approached by a restaurant owner whose business is in Baghdad’s bustling Karrada area. “He told us a police officer was charging him protection money and forcing him to give him free food,” al-Saadi says. “We stopped this officer from blackmailing the restaurant owner. Even though the police cannot protect anyone or maintain security, they still extort the businesses. The government is aware of how corrupt the police are,” he maintains. Most neighbourhoods in Baghdad now have a base – usually an office – belonging to whichever militia is present in that part of the city. This is also true for other southern provinces in Iraq. The militias sometimes work security and directly help local police, or they do other, more undercover work, where they and their informants roam streets, markets and residential areas in civilian clothing, watching out for terrorist activity. The fact that the militias have played such an essential part in the fight against the extremist Islamic State, or IS, group over the past two years has made the groups very popular, especially among young local men. It is hard to join the army or the police and often requires that candidates bribe their way in to the regular wages. So it’s become more popular for young, unemployed men to join a militia instead. Additionally, it is also clear that often official security forces – and the local police forces in particular – have not been capable of protecting the cities in which they work from terrorist bomb attacks. Hundreds of Iraqis were killed in a series of suicide attacks targeting residential and commercial areas, just since the beginning of this year. Since 2006 security in Baghdad has been in the hands of the so-called Baghdad Operations Command. This body is tasked with keeping Baghdad secure and is composed of around 70,000 members drawn from the regular Iraqi army, military police and regular police as well as intelligence services. However not many locals appear to think they are up to the job. Last week Mohamed al-Bayyat, a senior member of the Badr organization which is responsible for one of the larger militias, said that Baghdad’s official security forces had been infiltrated by “enemies” – by this he means extremists and terrorists. “The Baghdad Operations Command is unconstitutional,” al-Bayyat said in an official statement, that called upon the Iraqi government to rethink the capital’s security and “to involve the Shiite Muslim volunteer militias more in protecting Baghdad”. This is not the first of these kinds of criticisms and doubtless it will not be the last time the two forces clash. In September 2016, there was even a physical clash. Shiite Muslim militias fought a battle against the local police in the Zafaraniyah area. The militias’ aim was to arrest police who were supposedly helping the Islamic State group, even though the local police denied this. In November 2016, the Iraqi Parliament passed a law regarding the volunteer militias that had formed after the beginning of the security crisis in mid-2014. The militias were formed by volunteers who offered to fight the IS group and to protect their homes, in the face of the Iraqi army’s weakness. The new law has made the volunteer militias an official body – that is, no longer “volunteer” – but it has not specified what role the militias should play in the future. Would they be like the Iraqi army, called in to fight battles? Or would they be able to operate more like a local police force inside Iraqi cities? As yet, the answers are unclear. On the other side of the situation, the militias are making it increasingly difficult for local policemen to do their jobs properly. Senior police officers are forced to cooperate with the senior members of the militias that work in their areas, if those areas are under the police’ control at all. Civilians in Baghdad complain about the increasing security chaos and the fact that there is theft and kidnapping in broad daylight. They can’t understand why these culprits are not caught or how they manage to pass through so many official checkpoints on their way to and from the scene of the crime. But often the identification carried by the culprits is counterfeit. For instance, on Jan. 2 this year an Iraqi woman was sentenced to five years in prison for impersonating a senior officer in the militias; she had 14 other fake ID cards with her when she was caught. Sometimes the militias in one neighbourhood even fight one another and the police have to remain neutral – meaning they don’t stop the fighting. This is yet another sign of the waning power and prestige of local police and the waxing of the militia clout. The imbalance is such that some of the militia fighters appear to believe themselves above the law. Among the militias themselves the leaders say they respect the rule of law but that it is difficult to monitor their men, who are deployed all around Baghdad, let alone the men from other militias. Late last year, the cleric Muqtada al-Sadr, who heads the Sadrist movement, of which the Saraya al-Salam militia is part, declared that everyone should respect the local security forces. “Nobody has the right to attack them, even under the banner of the militias,” he stated. Nor is this problem limited to Iraq’s southern provinces, populated mainly by Shiite Muslim Iraqis. The Sunni-majority provinces are also experiencing difficulties with militias, as armed tribal groups take charge of security in provinces like Anbar and Salahaddin. Majid al-Thayabi is a member of one these Sunni Muslim militias working in Ramadi, the capital of Anbar province. He acknowledges that the tribal militias are becoming stronger – but, he argues, this is because the police and the army are weak and there are not enough of them.